Consideration was given to a segregated two-way cycle route between Clontarf and Dublin city centre but this was deemed to be too problematic, Dublin City Council has said. Responding to questions from IrishCycle.com, the council said that there would be some segregation, where bicycles are kept away from cars and buses,but that there are locations where it will not be possible, including at bus stops and at large junctions. 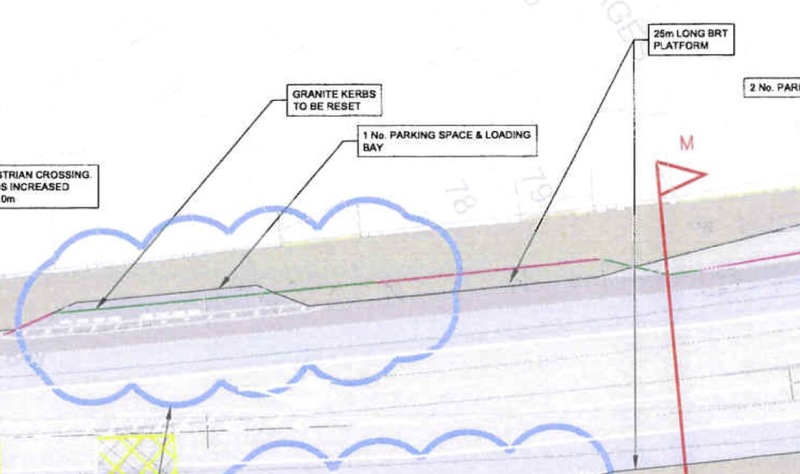 According to draft drawings which we previously reported on and published, there also appears to be no segregation on large sections of the cycle route alongside parkland and where there is a large central traffic island. Parking and at some points three traffic lanes in the same direction are retained. The route also carries heavy traffic and large amounts of buses. It is planned to be used as part of a future BRT, or bus rapid transport, route which is to use long bendy buses — draft drawings show cycle lanes between “BRT platforms” and bus lanes. The mayor of London phased out bendy buses due partly to safety concerns for cycling and walking. After councillors voted down plans for a key link on the S2S Dublin bay route via the East Wall area, the on-street Clontarf route is the only planned link between key segregated cycle routes including the Liffey Cycle Route, the S2S, the Dublin to Galway Greenway on the Royal Canal, and other routes.